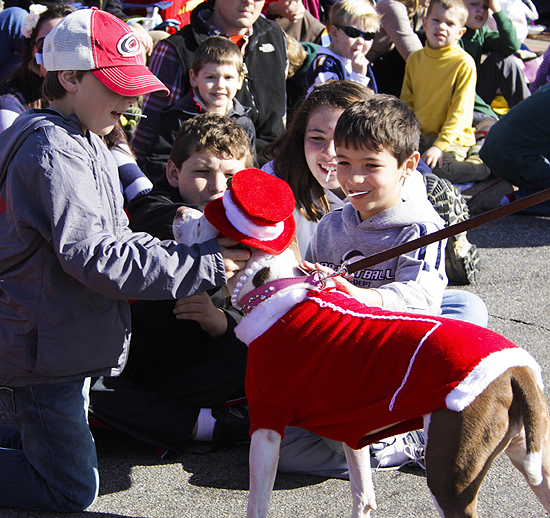 On Nov. 19, 2011, The Positive Pit Bull, Inc., a nonprofit in Raleigh, N.C., was proud to be a part of Raleigh’s Christmas parade! Nearly 30 pit bulls marched, danced and pranced their hearts out along the route, along with hundreds of other groups, while thousands watched and were delighted by the sight. 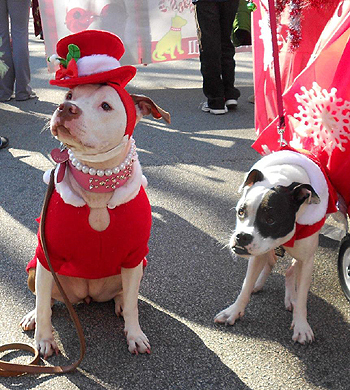 The Positive Pit Bull’s people were dressed alike in their festive bright red Rock-a-Bully shirts, and their dogs were decked out in holiday fare as well, from Santa hats and red sequined bowties to green tutus with red bows. A giant “Happy Holidays” banner draped in red tinsel garland led the group, and at the center of the group’s display, carrying their main message sign, was none other than the Duke of Elvis (Steve Cates, Elvis impersonator) in his flowing red silk-studded Elvis outfit and cape. Just in front of Elvis rolled a tiny “float” with a life-size replica of Cricket, the group’s little ham. Cricket herself was decked out in a red and white Santa sweater and red top hat. Meanwhile, sugary sweet pit bulls pranced all about, kissing children and licking hands extended all along the parade route. Cuda, (right) a deformed pit bull and a product of inbreeding, of cudacares.org, marched along with the group as well! 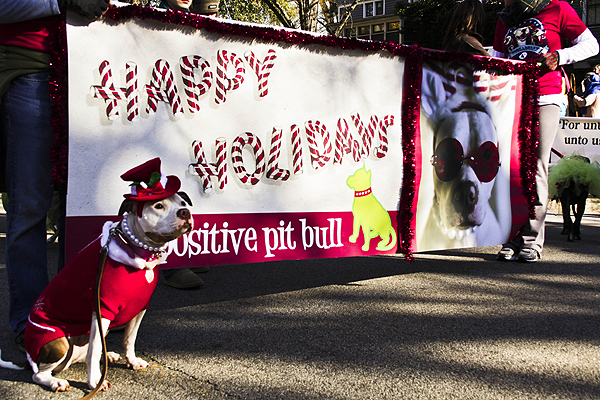 The Positive Pit Bull’s hope in participating in this parade was to raise awareness regarding the breed and to change some minds along their way. After the parade, people who saw it were encouraged to vote for their favorite participant in the parade, and The Positive Pit Bull was chosen the winner of the People’s Choice Award! What a positive message a win like this sends to the world about the American Pit Bull Terrier, the group’s favorite breed! This was an amazing opportunity to bring awareness and positive attention to the dogs that always seem to get nothing but negative attention! The Positive Pit Bull could not have been more proud than to have helped bring awareness to the breed by participating in the parade. The Positive Pit Bull also holds community events that offer education, training, free vaccines, microchips, food and supplies. 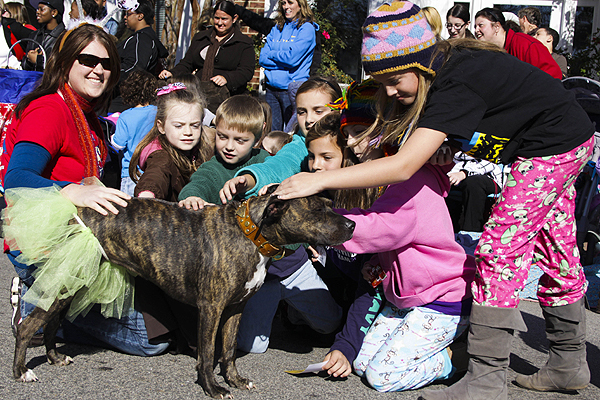 They also offer socialization opportunities for community pit bulls with a monthly pack walk. An organization member is available to speak to any groups interested in learning more about pit bulls. Now this makes me smile!! AWESOME story please keep up the great work you’re doing and everyone looks happy! @theprettychic Shouldn’t we have pit bull parades every where!!!?!! @StubbyDog YES, they should and because this is the YEAR of the Pit Bull it’s our duty to ensure they have a parade everywhere. @BrookeLR We are going to pass your info along to Paige and a lawyer would knows about pit bull legislation.